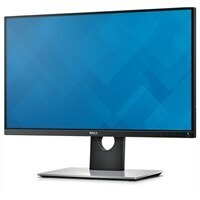 Expect vivid, accurate color precision, ultrathin bezels and the widest color coverage to suit your professional needs with the Dell UltraSharp 25 Monitor with PremierColor. Ideal color coverage: Enjoy exceptional color accuracy and consistency right out of the box with an extremely precise Delta-E < 2 factory calibration. The new UP2516D Monitor with PremierColor offers wide coverage of industry color standards with four color spaces, plus user-enabled color customization. Outstanding view: Experience seamless dual or multi-monitor setup with ultrathin bezels. You can count on beautiful clarity with QHD resolution, plus consistent color across and ultrawide viewing angles. Unrivaled reliability: Get complete peace of mind with Dell’s Premium Panel Guarantee and Advanced Exchange Service.